Question: How exactly does Curiosity's floating bus work, and how does it continue to operate when voltage drops from 11 to only 4 volts? There is a general, generic answer here about possible ways a floating bus might work, with a diagram of a electrical → light → electrical converter. Is that what's happening on Curiosity? There's a 100 W "light bulb" in there somewhere? The term "floating bus" means the power supply is not connected to the rover's chassis. In for example a car, the body is used as part of the electrical circuit: the negative terminal of the battery is connected directly to the body. This means every electrical component needs only one long wire to the positive terminal of the battery, and a short wire to the nearest part of the body. In some cases, electrical components are designed with a metal housing that acts as the ground connection, so there's no ground wire at all. This all works well, with one exception: when a positive wire contacts the body, you get a short that can damage the electrical system. Although most circuits are protected by fuses, there is at least one high-current circuit that isn't protected: the starter motor. If you wanted to convert your car to use floating circuits, you'd have to replace all these ground connections with wires to the negative terminal. And you'd have to insulate all components from the chassis. As a result, when either a positive or a negative wire contacts the chassis, nothing happens. I'm not convinced the answer here is correct. The circuit shown there is the correct way to connect a non-floating circuit to a floating circuit. But in Curiosity's case, the entire electrical system may be floating, so you don't need this conversion. I haven't found a source that specifies this though. Either way, the voltage they measured was between the power bus and the chassis. This indicates there's contact between the bus and chassis. The power bus voltage remained nominal, I presume, or they would have mentioned it. A short between the positive and negative sides of the power bus would have been a much bigger problem, as this would have reduced the amount of power available to run the rover. "The vehicle is safe and stable, fully capable of operating in its present condition, but we are taking the precaution of investigating what may be a soft short," said Mars Science Laboratory Project Manager Jim Erickson at NASA's Jet Propulsion Laboratory, Pasadena, Calif.
A "soft" short is a leak through something that's partially conductive of electricity, rather than a hard short such as one electrical wire contacting another. Not the answer you're looking for? 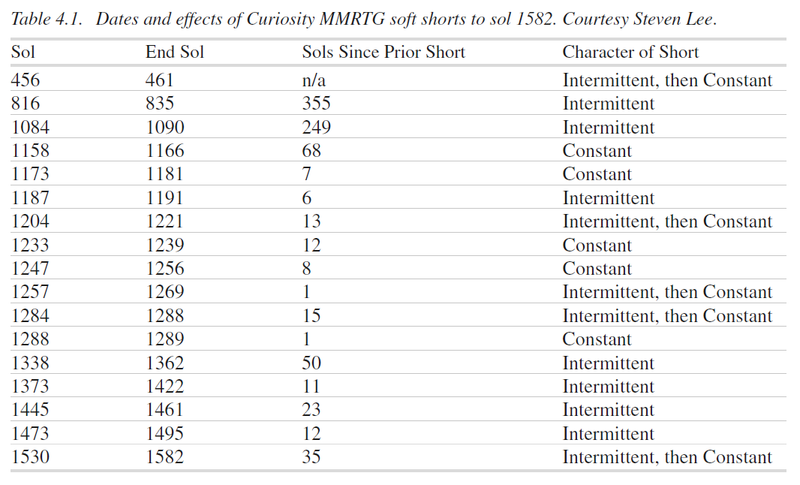 Browse other questions tagged rovers power curiosity rtg or ask your own question. What caused Curiosity's electrical trouble?